Primary Natural Resources peanuts, millet, sorghum, corn, sesame, cassava. 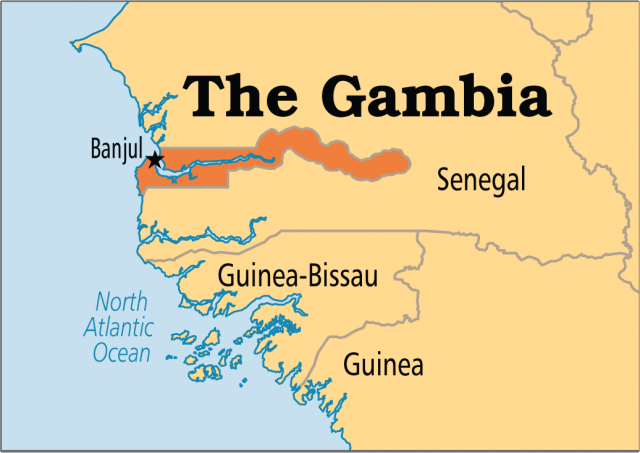 GAMBIA IS BORDERED by the ATLANTIC OCEAN on the west and surrounded on the remaining three sides by SENEGAL. The smallest country on the continent of Africa, Gambia is composed of a narrow strip never more than 30 mi (48 km) wide. This narrow strip of land borders the banks of the Gambia River for 200 mi (320 km) above its mouth. The river, whose source is in GUINEA and which flows 600 mi (970 km) to the Atlantic, is navigable throughout Gambia and is the main transport artery. Sand beaches line Gambia’s coast, while inland lie swampy river valleys whose fertile alluvial soils support rice cultivation. On higher lands are cultivated peanuts—the country’s chief cash crop—and some grains. The climate is warm and fairly dry. A large number of ethnic groups live in Gambia with a minimum of intertribal friction. The Malinke (Mandinka) is the largest, followed by the Fulani (Fula), Wolof, Diola (Jola), and Soninke (Serahuli). Approximately 3,500 non-Africans live in Gambia, including Europeans and families of Lebanese origin. More than 95 percent of the population is Muslim, while Christians of different denominations account for most of the remainder. English is the official language, but a number of African dialects are spoken in the country. During the late 17th century and throughout the 18th, FRANCE and England fought continuously for political and commercial supremacy in the regions of the Gambia and Senegal rivers. Great Britain was given control of Gambia by the 1783 Treaty of Versailles. Gambia achieved independence on February 18, 1965, as a constitutional monarchy within the British Commonwealth. On April 24, 1970, Gambia became a republic following a referendum. Until a military coup in July 1994, Gambia was led by President Sir Dawda Kairaba Jawara, who was reelected five times. In November 1996, the retired Colonel Yahya Jammeh became president of the Republic of The Gambia. He was reelected in 2001. Despite attempts at diversification, Gambia’s economy remains overwhelmingly dependent on the export of agricultural products, of which peanut products form the bulk. Other exports include dried and smoked fish, cotton lint, palm kernels, and hides and skins. About three-quarters of the population is employed in agriculture, which accounts for 33 percent of the gross domestic product. Millet, sorghum, rice, corn, cassava, and beans are grown for subsistence. The main industrial activities lie in the processing of agricultural products. The EUROPEAN UNION, CHINA, JAPAN, and Senegal are the country’s leading trading partners. Gambia is one of the poorest nations in the world and heavily dependent upon foreign aid.